Long and McQuade and most major music stores in Canada are terrible at many things, including being fair... they wouldn't bother sometimes offering money for amps/pedals including my GT-8 (about 2 years ago). I'm sure ebay or the classified section in this forum would be a safer bet. I sold all my extra guitar related stuff there... yet it is highly unlikely you'd be able to sell it for the MSRP price. Hi, I know that feeling. That's why I called Elderly on Monday and had them send back that Slingshot. I'll just have two guitars. They both have 25.5 scales. I remember going to a Firebird from a Jazzmaster, and it took time to get used to the shorter scale(again,,I grew up on an SG Special in High School). It is better to know than to believe. Live is like a box of chocolates; you never know what you're going to get. Get rid of it before you adjust to the scale and neck. Cuz once you do on a Parker, everything else feels inferior. That's what happened to us. I even enlarged my pup routes with a dremel to get a different set of pups in. I ain't given up this axe. Nobody wants to give me squat for my 1980 strat cuz I put a floyd rose in it. My 78 The Paul is valued at some stupid sub K number. Yeah, investor or player, I'll be a player. I don't agree that a buying a guitar is "an investment". It's just an instrument that you bought, and it's your tool for creative expression. Buying an extra home or a piece of land is an investment. Or if you are fool enough to buy a '54 Strat for $40,000, that I guess could be called an investment. But why bother with that? Who needs a guitar that they can't really play because "it's an investment"? Lots of opinions out there. This is rather nice. probably the first real, worthwhile discussion on a forum in a while...maybe ever? Yes, there are two schools of thought it seems. I unfortunately come from the latter of the two. During my time working for George Gruhn, I saw a lot of guitars and heard and saw alot of things. I used to work on the fourth floor also known as the "repair & restoration" floor. I was surrounded by some of the biggest guitar snobs you have ever met. There we some guys up there that were so snobby and arrogant that they claimed they could hear a difference in "orange drop" capacitors and "mallory" capacitors. Just ridiculous. They unfortunately had a way of taking the fun out even playing guitar. George once said that guitars are one of the best investments around. They are more stable and usually much of a lesser risk than the stock market itself... and I can agree with him on this. I saw in the matter of 6 months the value of a 1960 Gibson Les Paul increase $35,000.00...absolutely unreal! Anyways, I began this thread out of sheer frustration. My question (that was never really answered) was How does a guitar or anything for that matter of quality & US manufacture map for nearly $4300.00, Retail for Nearly $3300.00 and not get scooped up at a price of (now) $1575.00? The Parker Fly is an amazing guitar. It has it all. All the innovation, science, tonality, playability, versatility & the list goes on. How does something with all these inherent qualities not retain very much value? It is mind boggling. No offense (and I love all of you guys for partaking in this discussion) anytime you lay out a decent sum of money for any sort of property or the purchase there of you make an investment. There is no sense in arguing this (blame it on semantics if it helps you sleep better) as I am sitting with a more recent version of Merriam-Webster's Collegiate Dictionary and the meaning of the worr has not altered very much since it's conception...so, purchasing a guitar is an investment. Merriam-Webster also sites an investment as being the outlay of money for income or profit. So, if you own a Parker Fly (or bought one) and you play out at bars or clubs and make some income (small or substantial) you are utilizing your "investment". My complaint about the Parker Fly and my reason for such disillusionment is more so connected to the "for profit" part of the literal definition of the word. Ideally, if a Parker Fly Mojo's MSRP is roughly $4300.00 a dealer should expect to invest 40-50% in the guitar. This would be anywhere in the ballpark of $1700-$2150. If MF is selling these new at $3300.00 they are making in the ballpark of $1150-$1300 on their "investment". US made instruments on the whole should only initially depreciate (if in pristine or near mint condition) about 20%... Gibsons & Fenders tend to mirror this and unfortunately, they tend to be the basis of comparision. Parker guitars seem to be a better made, more well thought out guitars and some might say are pieces of art even. Being made in the USofA it would stand to reason that they would mirror this. Martin, Taylor & even Guild guitars tend to even mimic this formula...maybe with some minor deviation in the percentage. If Parker guitars are as good of an investment as they rightfully should be then a barely-played, near mint condition Parker Fly should sell easily at about $2600.00 and a place like Guitar Center should be more than happy to invest $1200-$1300 in this same guitar...not $700.00...because I know darn well Guitar Center is going to initially put a price tag of $2500.00 on it!!! Check the Guitar Center website for a Parker Fly Mojo...you'll see what I mean. Someone told me that underselling a Parker would be harmful to the line as a whole and I agree with this sentiment somewhat...but, we as consumers, basing the value of our investments solely on what ebay or what people ignorantly deem as the "market" (I am still referring to ebay) completely debases and nullifies the true value of anything. If this is true, which it seems to be then I come to my second question...Are Parker Fly guitars overpriced? Yes, they are and it seems that USM is "out of touch" with the "market". This rings true when I see several ads on this forum requesting to get a used Parker for about a grand...and we will buy at a grand at the flip of a hat...snap! You think you know what I am going to say next...? DragonFlys are NOT Flys. To me the things that make a Fly a Fly is the set neck, the ergonomically carved back, the carbon epoxy reinforcement and the ball-bearing "flat-spring" tremelo. This is what separates the men from the boys. The Generation 1 or "pre-refined" Flys are selling for less than $1200.00! 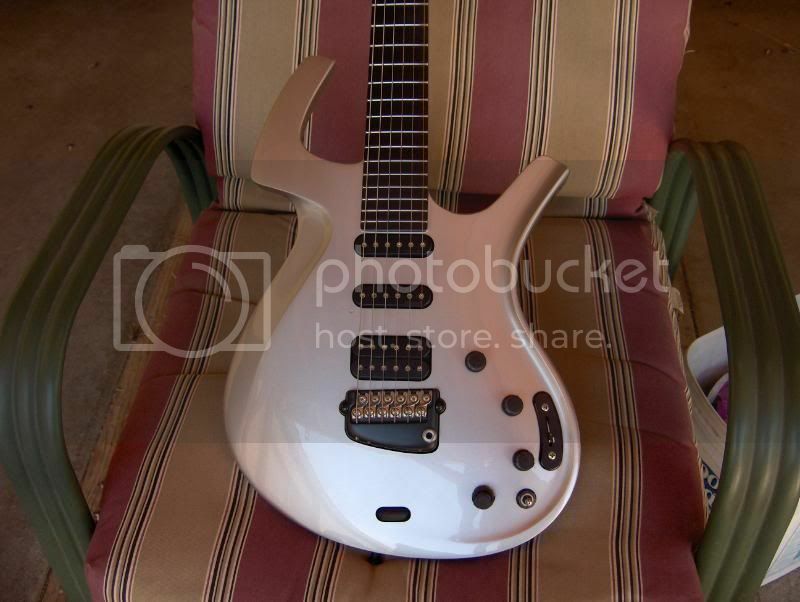 They have the aura of being pre-washburn...and this is the guitar that people are buying up in a snap and are fighting over on ebay and craigslist. It seems to me that the refined and more "cost effectively produced" Parker Flys Should retail for considerably less to begin with and should have lower MSRP prices to help the brand and to "mirror" the activity of what many regard as a better built instrument (this being the Generation 1 Flys). This said, the current production Flys are excellent pieces. I actually find them to be overall, a more improved or "refined" Fly than the Generation 1 Fly except... I like the access to the balance wheel better on the older Flys and I like the tremelo locking mechanism better on the older Flys... because you can literally lock it or unlock it on the "Fly" instead of with a screwdriver or wrench. Other than that I find the newer Flys like the Mojo I have, superior. The electronics have a better built in longevity to them, no more brittle ribbon cables, simpler controls, a slightly beefier neck and all the charm of the originals. My particular Mojo is no exception... and is truly more than I expected it to be. Parkers are great for what they are, but are in fact overpriced by the manufacturer, overpriced by dealers, under valued by the "market", under valued by used dealers...they are a NOT a great investment in terms of turn-ability or for the average Joe. The whole pricing structure is a mess. Someone needs to fix this or they are going to kill the brand...but, I doubt corporate cares about the used market of their instrument so as long as the get their price point from the dealers? On the lighter side, I still have a 2008 Parker Fly Mojo for sale! Asking $1575.00 shipped...a truly under-appreciated masterpiece just one paypal payment away! Saying something is an "investment" is one of the things to say when selling sap to the suckers. Remember the years and years of saying a house is an investment. The smart people said a house was an expense all along. Now the suckers are paying for their foolishness. If it is a unique house or property it can be an investment. Or an everyday property bought at a good enough price. A guitar as an investment is a gamble on fools being a long line coming and hoping you're not the last in the line. Unless the guitar is unique or special for some reason that someone is willing to pay for. I won't buy a 24.5" scale guitar at this time because the 25.5" scale is what I want to be able to play. The 24.5" is too easy to get used to so I would keep the Parker and play it a lot, 25.5" is different as you have said. "Brainverms come crawling and creeping and eat you when you're sleeping." If, in another reality, Parkers were played by say 1/4 of the pros, sharing the endorsements with Gibson, Fender, & Ibanez, then I think they would've retained a better value. But that didn't happen. I don't think Ibanez really gets the same status, but certainly is in the hands of many pros. Many factors have caused this situation. To many to list. That is unfortunate because their retail price was reasonable during the last 20 years as compared to the equally priced Gibson & Fender junk. I can't understand it or explain it. But only a few select models truly become an appreciating investment and knowledge of these models, as true as in any investment can make or break the bank. We are all sad here knowing this poor resale value issue. Because these guitars are considered to be the best by most here. Dear, I don't see what your problem is. Your Fly is an excellent complement (!) to your SG in features, function, tone, handling, etc. Why not try to unlock its potential some more. With a Fly you can cover tonal ground, you can't reach with an SG: Piezo, Trem, Coil-Tap. Go there. Try to get away from that "I don't love it, I don't feel it"-frame-of-mind, most of the time this only means you didn't give it enough time to readjust coming from years of playing another guitar. It's very easy to make a thoroughly rational case for a Fly. It's a guitar that is nice to have in the arsenal. And one last word of wisdom: If it matters to your music what guitar you play it with, then the guitar is NOT your problem. In conclusion: Sell your SG and keep the Fly and you'll rid yourself of all the problems discussed in this thread. I don't agree that "real" Flys are overpriced - the technology they contain is a) unique and b) fantastically well adapted to guitar players' ergonomic needs. The problem, as we all realise, is that very few people know Parker guitars. I'm perhaps in an extreme case of not living in the USA [ ] but in Europe most *guitar players* (never mind "civilians") I speak to just look blank when I say I have a Fly. So spending even $1500 - 1800 for a used Fly seems to them to be crazy. And I feel that for some reason, Parker have never really tried to market Flys in any meaningful way, particularly outside the US. You just can't see them in music stores, and have to buy them sight unseen on trust, which clearly is not going to reassure the majority of potential customers. And I regluarly use a Patrick Eggle Berlin (25" scale) as well as my Fly, and don't have problems adapting - maybe you need to give it a bit more time? 2001 Fly Classic -> Digitech GSP1101 -> PA.
From what I've heard Parker Flys are sold at nearly break even price with very little profit. The reason they don't resale high is demand. Plain and simple. The Parker is the greatest innovation to the electric guitar since the humbucker or the Floyd Rose. Fender and Gibson have decent resale value because people want them. I think the real reason Parker never got big was the look. It was a take it or leave it kinda guitar when you looked at it (I never bought one until the Single Cut came out). Now the DF series is trying to redefine the Fly and get more market share. I mean really only 2-3 big endorsements with some big bands could send the Parker line through the roof. But until then we have to endure low resale. I bought my Single Cut new for $2300 and now it sells on clist all day for $850. Oh well, I just won't sell. No big deal. I love my guitar. I paid Eldy 900 eur, go figure. Yes it needed a little fix, but with less than 300 eur it came back from Parker support and it's WONDERFUL (as u can hear from my various soundclips). Ryan and co did a great job! I am sitting with a more recent version of Merriam-Webster's Collegiate Dictionary and the meaning of the worr has not altered very much since it's conception...so, purchasing a guitar is an investment. Merriam-Webster also sites an investment as being the outlay of money for income or profit. So, if you own a Parker Fly (or bought one) and you play out at bars or clubs and make some income (small or substantial) you are utilizing your "investment". You could argue that point, I suppose. To me, that means any time I spend money for anything, I am making an investment then. I buy a burger for lunch. I just invested in my future because I won't starve, at least for today. Just seems silly to me. As with any other investment, there is risk. I am now living in a house that is worth 45% of what I bought it for in 2006. That should have NEVER happened, but yet it did. No one will ever convince me that an 50 year old hard to play guitar is worth $40,000-50,000. People who have too much money and not enough sense are the ones who have jacked up the prices of old guitars to the point of being absurd. If, in another reality, Parkers were played by say 1/4 of the pros, sharing the endorsements with Gibson, Fender, & Ibanez, then I think they would've retained a better value. But that didn't happen. I don't think Ibanez really gets the same status, but certainly is in the hands of many pros. Many factors have caused this situation. To many to list. If Eric Clapton or Jimmy Page (or insert other big name here) played a Fly and they were around back then, everyone would want a Fly. The Fly is fighting against tradition and guitarists who are ridiculously traditional and don't see the value in it and/or think it looks funny. The big names have been playing Fender Strats / Telecasters, or Gibson Les Pauls / SGs since the 50s. Once in a while you'll see an Ibanez, Joe Satriani has been playing them since the late 80s. Frank Gambale used to play one for a while, too. I think the real reason Parker never got big was the look. It was a take it or leave it kinda guitar when you looked at it (I never bought one until the Single Cut came out). I agree. No demand and the average guitarist would say "it looks weird". It's all about looks and image for some people. They have to play the same guitar that their guitar heroes play, we all know what they are. And so Parker is fighting against people so steeped in tradition that it's really ridiculous. 1. With some exceptions, anytime you buy something subject to wear and tear (car, boat, guitar, motorcycle, etc), it depreciates as soon as you walk out the door. I put a guitar in the same category as a car. To expect that you will get as much for a car as you paid for it a week after you bought it is ridiculous. Unless it's a "classic car" that is still in good shape after 40 years and there are collectors looking for your car and are willing to pay what you ask. 2. In the case of the Fly, it costs them a lot to make one because of the labor and materials (that composite is very expensive), and the profit margin is small. Then a dealer buys it and someone buys it and then doesn't like it because "they don't look right" for their band and then they want to sell it. Then they get mad because no one will buy it for what they think is a reasonable price because there isn't a demand for it. It's really not rocket science. There are guitars far rarer than a '54 Strat, like a 1918 Gibson Style-O, which in my mind should be worth a lot more and yet they are only worth 10% of that '54 Strat. Basically something is worth what someone is willing to pay for it - in the private sector. Retailers are playing a different game, it's all about making a profit. You go to sell them something, and they are going to give you the absolute minimum that they know they can get away with and sell it for the absolute maximum that they know they can get away with. Yes- Parker should really invest in marketing and by gaining a "big name" playing their guitars. There's people in the US who would pay 2-3 times that for one. There's nothing magical about that guitar. It's just an old guitar, there's no pixie dust all over it and there's no gold or diamonds on it.